This group of entrepreneurs brings together CREW Boston members who own their own small businesses to exchange information and learn from each other’s experiences, particularly those matters that are unique to the small business owner. Programs explore issues identified by the group as critical to the small business owner and often feature industry experts from various market sectors. Members meet monhtly at the offices of Construction Coordinators, Inc. 12:00-1:30 p.m. for a brown bag lunch. We had a packed room for our Entrepreneur Exchange meeting in January. Advisors from MSW Financial Partners, Penret Services, Inc., and OneDigital Health & Benefits joined us for a comprehensive benefits refresher covering pension benefits -- Profit Sharing, Cash Balance Plans -- company and personal insurances, and planning options available to our members' smaller, closely held businesses. What could have been an overwhelming 90 minutes of confusing acronyms and jargon was actually a very interactive discussion among our members and the speakers. In February, the Entrepreneur Exchange was joined by Angela Parziale, CPA, MST, Shareholder with Walter & Shuffain, P.C. Certified Public Accountants & Business Advisors. Angela is an active CREW Boston member, past Board member and Treasurer, AND Achievement Award Winner! Just in time for tax prep season, Angela gave an overview of her role at Walter & Shuffain (WS) and their services, then fielded a wide range of questions from a diverse group of business owners and managers. She also provided a reference packet from WS for our use. We discussed retirement plan options and defined benefit plans, health savings accounts and consortium plan opportunities. In January, members of the Entrepreneur Exchange met to discuss goals for 2017. By breaking into small groups, stating a goal out loud, and putting it on paper, members got a kick start and plenty of feedback from peers in the room. It’s not enough to have satisfied clients – we need to have enthusiastic clients! The Exchange Group had a great discussion on targeting new clients, building relationships, maintaining good clients, (and firing the "C-list" clients) with Lauren Stakutis of Strategic Adrenaline at our December meeting. 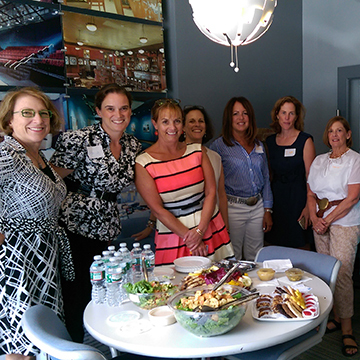 Following up on June’s CREW Boston Annual Meeting, and as motivation to FINALLY read one of these amazing women's books, the Entrepreneur Exchange Group held a discussion of luncheon speaker Carla Harris' 2014 publication, Strategize to Win. While we didn’t all manage to read the whole book in time, Carla’s words at the annual meeting certainly gave us plenty to talk about. Discussion of how Carla’s Pearls and strategies translate to entrepreneurs and small business owners was extremely insightful. We look forward to getting into some of these topics in future meetings. In October and November 2015, the Entrepreneur Exchange Networking Group was joined by Angela Pitter of LiveWire Collaborative for a two-part interactive workshop. ​In addition to having a few hours devoted to confronting our limited, outdated, and/or BLANK LinkedIn profile pages, we discovered some of the power of the world’s largest professional networking site.